Rietz spoke with HConnections Managing Editor Stephanie Cepak during his visit to campus for Grandparents University. This year marked the 10th anniversary for the program. Rietz has nine grandchildren and noted this was his third time so far participating in the program. In recent years the Honors College alumnus has helped in the development of the curriculum for the actuarial science major – likely changing the lives of students for years to come. It all started when Rietz was a student himself. Rietz knew he wanted to go into the field of actuarial science, but MSU didn’t offer it. Instead, MSU offered, and continues to offer, a strong mathematics program. It was during that time that two professors took interest in Rietz – Gerry Ludden and James Stapleton. At that time, there were 10 actuarial science exams a student had to pass to go into the field. 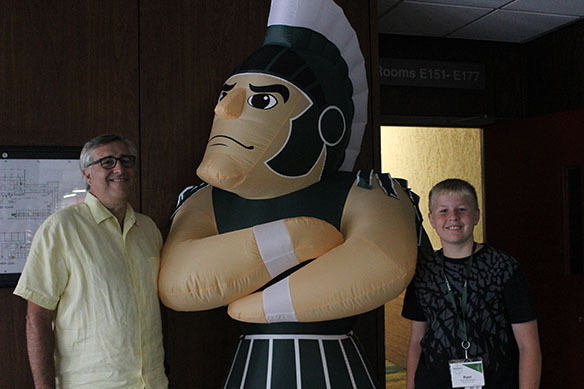 “There were two professors who took time out of their schedule to help me prepare,” Rietz said during a visit to campus for Grandparents University this summer. Rietz completed three of the 10 exams during his time at MSU. After he graduated in 1970 with a degree in mathematics, he started work for Lincoln National Life Insurance Agency in Fort Wayne, Indiana. His career led him back to Michigan to work for Watson Wyatt Wordwide (now Towers Watson), the oldest actuarial firm in the country. Eventually, Rietz helped with recruiting, and turned back to MSU’s strong math program to look for employees. It was when he was working for Deloitte that Rietz met Yang Wang, chair of MSU’s Department of Mathematics at the time. Yang was interested in starting an actuarial science program, and Rietz worked with him and others, including Albert Cohen, in its development. In 2012, students began having the option to major in actuarial science through the College of Natural Science.